Last time I wrote JJ and I had put together a list of things he wanted to do this week. One of the things was setting up the tent. We set up the tent yesterday afternoon and put the mattress and sleeping bag out there. 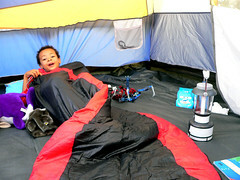 JJ then proceeded to put half of his belongings in the tent with him and he willingly went to bed at the allotted time. Monty dog was in there with him much to her disgust but I let her out after she barked at a car moving ten blocks away. Here he is telling me that he will stay in the tent and not get up too early. It was hard for me not to check on him every ten minutes but I knew if I did that he would find an excuse to come inside. I did make it quite clear that the back door was open for him to come inside any time he wanted. He had the lemon tree not far from his front door so he didn’t need to come inside to go to the toilet for number one’s. 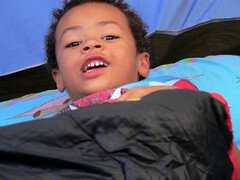 He took a while to get to sleep but not too long after dark, he did and he stayed in the tent all night. I really didn’t think he’d do it and I’m really proud of him. Mind you at 6.19am he bounded into my room and informed me that it’s going to be 24 degrees here today. I told him that he’s not to turn on the television before 7am and to go back out to his tent. I think he woke up before it got light! But back out to his tent he went and I fell back to sleep to wake up at nearly 8 o’clock. Bliss. JJ looks pretty happy out there in the tent. What a big boy he is becoming Jen. So cute…. Jj – looks very pleased .My 14 yr and one friend came back inside and left 3rd boy out in the tent last week – wimps ! lol….how wonderful. What a great first time experience for you and JJ to remember.